The fishing program is developed in a spectacular frame of mountains and lakes, in a small town called Epuyen near the National Park Los Alerces. 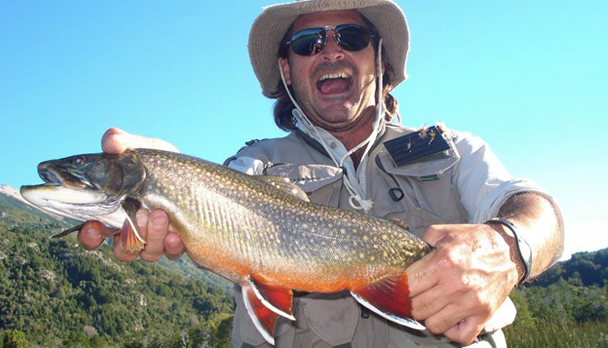 The fishing is carried on in the rivers Carrileufu, Rivadavia in the National Park Los Alerces, Lago Verde... etc, hosting rainbow trout and browns between 1 and 6 lbs, and in some of the rivers there are locked salmon that weight 7 lbs approximately. The lodge is located in a picturesque small town called "Epuyen" in the province of Chubut, in the Argentinean Patagonia, at the feet of the Andes mountain chain. Framed within a woundeful natural surrounding, it's few kilometers far from the Epuyen River and 50 km away from the National Park Los Alerces. 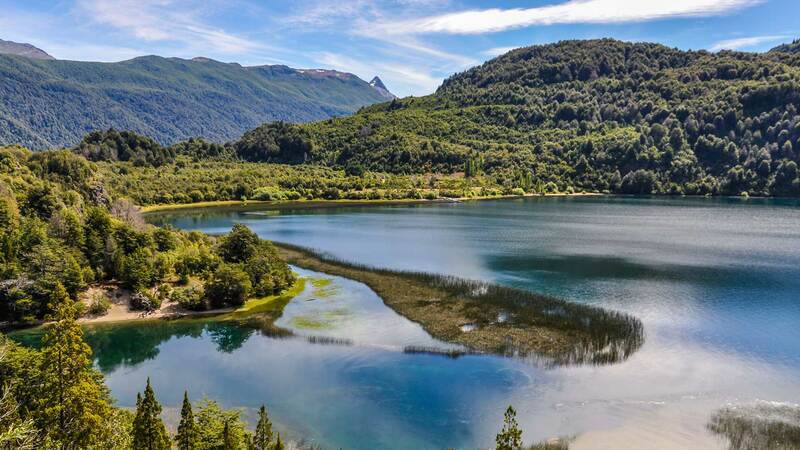 It can be reached from Bariloche with a 2 hour drive or a 50 minute ride from Esquel. The program is developed in various rivers where both modalities, wading and floating, are used to reach the fishing spots: Carrileufu River, Rivadavia and Arrayanes Rivers in the National Park Los Alerces, Verde Lake and Chubut River. These rivers are home to arco iris trout and brown trouts that go from 1 lb to 5/7 lbs. You can fish for raised salmon in some rivers that reach the 7 lbs as well. 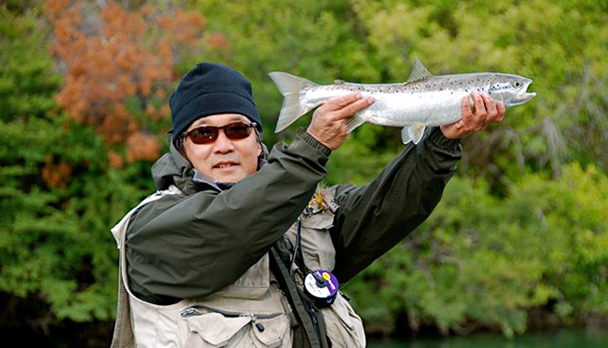 The recommended months for those who prefer fishing with streamers, are November to December and March to May. For those nymphs lovers then the appropriate months are from mid December to March. Day 0: Airport reception at Esquel and transfer to lodge. Meeting with guides and equipment preparation. Day 1: Fishing the Carrileufu River. Day 2: Fishing the Rivadavia River inside the National Park Los Alerces. Day 3: Fishing the Arrayanes river. Day 4: Fishing the Chubut river. Day 5: Fishing the Verde lake inside the National Park Los Alerces. Day 6: After breakfast transfer to airport. The guides move around in 4x4 vehicles and use inflatable motor boats for the fishing. The lodge "Las Pitras" has 2 double rooms with private bathroom and mountain view. With rustic mountain decoration, the lodge has open bar, a living room with fire place to chill out, an open space to share stories and a delightful patagonic cuisine with a wide variety of wines. The number of the rod depends on the size of the river, the conditions of each spot, and, of course, your personal tastes. This region offers a finer fishing and good weather conditions. To fish small brooks and medium-sized rivers the best average rod ranges from #2 with floating line to #6, with floating line, Shooting IV or a Teeny Line. In case of mightier rivers we recommend taking a strong #7 or #8 with Shooting Heads IV, apart from the tackle we have already mentioned. When choosing the appropriate flies, we cannot forget, among the streamers, the Wooly Buggers black and olive (size #4 to 10), Rabbits cinnamon and black (size #2 to 8), Matukas black and green (size #8 to 12), Blondes white (size #2 to 6), Cone Head Marabou Muddler brown and white (size #2 to 8). The nymphs we recommend are: Prince Nymph (size #10 to 14), Hare's Ear natural and black (size #10 to 16), Soft Hackle cinnamon and black (size #8 to 14), Kaufmann's Stone black (size #6 to 10), Montana (size #8 to 14). The most popular dries are Adams (size #10 to 16), Elk Hair Caddis natural and black (size #10 to 16), Red Humpy (size#10 to 14), Blak Gnat (size #12 to 16), Goddard Caddis natural (size #10 to 14), and Irresistible (size #12 to 16). Polarized sunglasses - a cap or a woolen hat, depending on the package and the time of the year (ask in advance) - sun block and hydrating lotion - bandannas for neck protection - Wading jacket - Warm clothes ( made of polar, capilene or synthetics to wear under the waders) - Check the condition of your wader and wading boots before traveling. In case of taking part of an expedition, take bathroom items (towel, soap, etc). Rates include: Transfer in/out, 7 nights accommodation, all meals and beverages, 6 full fishing days, fishing license and entrance to private lands, flies, 1 guide each 2 anglers, drift boat and and boat with engine to fish in the lakes. Rates do not include: Air tickets, personal insurance, fishing equipment, laundry service and gratuities. Notes: Ask for less fishing days. 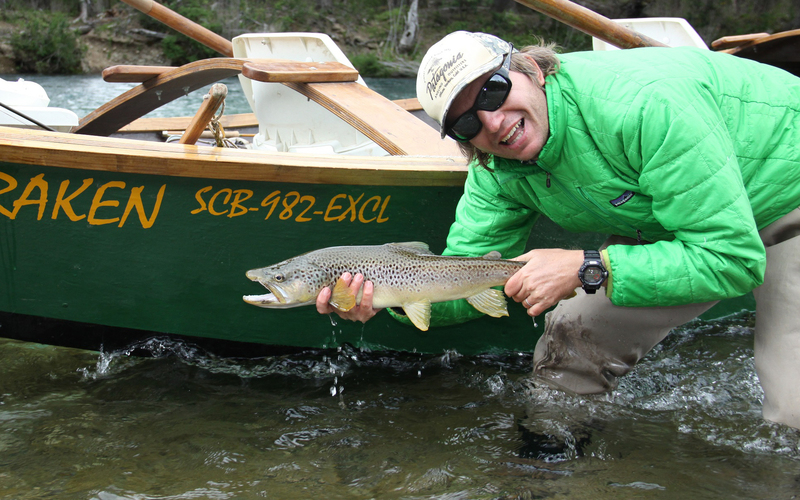 Very good fishing in the Carrileufu river, especially with streamers since waters were a bit high. There were strong rains at the end of the month which made fishing very difficult in general, turbid rivers and very high flow. There was little activity in the lagoons.